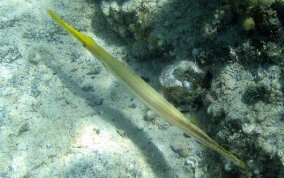 I've seen four Trumpetfish color variations. The brown,. The brown/tan, gray, yellow and the blue headed. Most often seen is the brown or gray coloration. 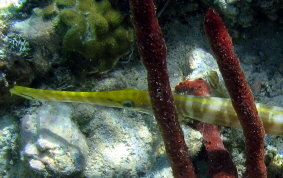 Trumpet fish hide both from their prey and predators by "becoming" a branch of a sea rod by standing on their heads, or by gliding into a sea plum and ambushing their prey with a lightening fast strike. 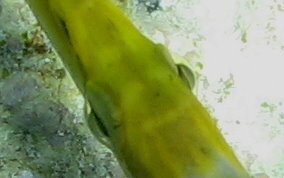 See my YOUTUBE video of a stalking Trumpetfish that includes a slow motion strike. 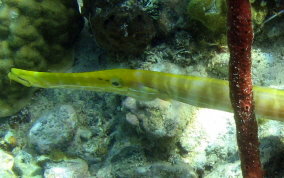 Trumpetfish can grow to 3 feet long and can be found at depths of about 6 feet or more.